Provide comfort for the family of Robert Fitzgerald with a meaningful gesture of sympathy. 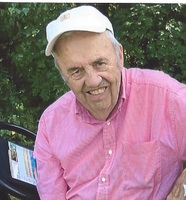 Robert T Fitzgerald, 86, passed away on Wednesday, February 6, 2019 at The Arbors in Shelburne, VT. He was a long time resident of both Burlington and Colchester, VT. Rob was born on February 1, 1933, in Winooski, VT, the son of Thomas and Mary Ellen Fitzgerald. Rob graduated from Cathedral High School and and obtained his Bachelor's degee at the University of Vermont. Rob worked for the State of Vermont Highway Department for 40 years. Rob married Carol King on September 10, 1955. Left to cherish his memory are his wife Carol; children: Stephen, Dennis (Cathi) and Beth (Bill). Grandchildren: Colin, Sadie, Kyle and Liam. Calling hours will be held from 11:00 am to 1:00 pm on Saturday February 9 at the LaVigne Funeral Home, Winoosk, VT, followed by a Mass of Christian Burial at St. Stephen's Church in Winooski at 1:30 pm. A burial will take place in the spring. Condolences may be shared at www.lavignefuneralhome.com. Provide comfort for the family of Robert T "Rob" Fitzgerald by sending flowers. Bob' s Family, Steve and Kevin and all sorry to hear of Bob's passing, I missed the closing event today and I apologize for not be present, my communications got twisted up. Aside from that Uncle Bob always had a great smile and some interesting comments about everything that I always thought were really cool, we go way back to the family reunions back in the 50's when things seemed to be so natural and pleasant, so goes life and we move on and hope we see the promised land as I'm sure Bob will be there when we get there. So sorry to hear of Mr Fitz’s passing. An amazing man. Hard working, respected, loved his family . Loved our basketball battles, waving to him on the roads,as he worked on so many projects for the State. God bless Mr Fitz. Love you! !